During the anniversary event of the Google Business Group Cagayan de Oro, I had the chance to meet one of the most famous personalities here in our city. 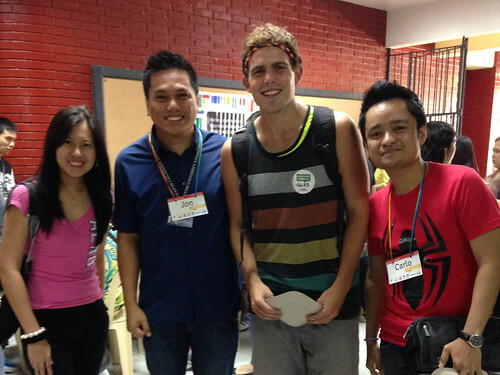 Locally known as "Kulas," Kyle Jennermann is a Canadian who fell in love with the Philippines, its culture and the people. He took it to the extreme by deciding to become a Filipino. He is currently staying here in Cagayan de Oro and based on what he shares on social media, he is really having the time of his life. He loves it here. You can really feel his passion to be like one of us, a people and a culture he did not grow up in. What a nice guy. His journey in becoming Filipino involves him having to try a number of things that Filipinos do. Eating balut (or duck embryo), ploughing the field and memorizing the alimango (crab) song are just some of them. Mind you. He has already ticked off a lot of them in his checklist. His enthusiasm in his journey brings a smile to our faces. But, at the same time he makes me evaluate myself as a Filipino. He made me realize a lot of things. I am a naturally born Filipino. I have been living in this city since I was born. Yet, this foreign guy is enjoying this place more than I do. Don't get me wrong. I love our city. He is just having more fun than I am. He is also patronizing everything we have here more than I do. In fact, he has tried out more local things than I've ever had in my lifetime. He has only been here for months. Bottom line is Kyle made me realize that there are a lot of things to enjoy in this city where I am in, in this country which I belong and in this culture which I grew up in. He is not only promoting our country and the people. He reminds us that some of the best things in life are just right in front of us. Now, over to you. Whether you are a Filipino or not, are you proud of where you are from?